As predicted, the Beeb has moved every staff member with a pulse to South Africa. 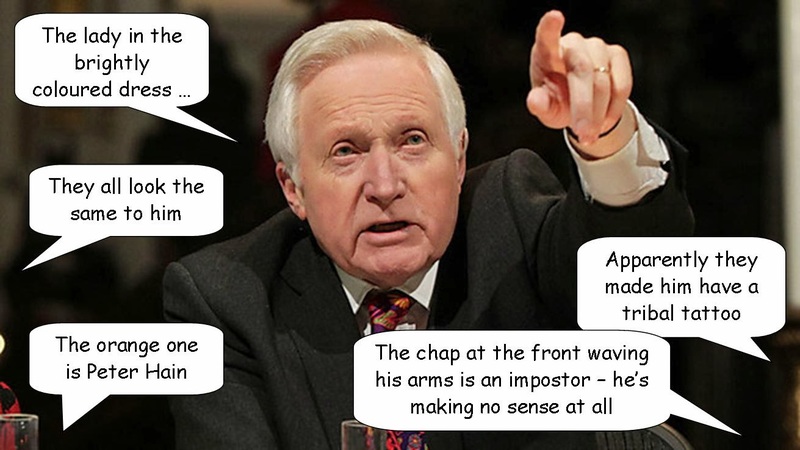 And yes, even the aged Dimblebimble qualifies - QT will be coming from Jo'burg tonight. I expect Mr Quango will be setting up his quiz when he also arrives there himself. top ten Effort Nick. The next front page of Private Eye beckons! The BBc just can't help themselves can they? They are like the 1980's Swedes. When asked by PJ O'Rourke on their 50% higher absentee rates compared to rest of Europe and their 50% higher sickness pay..And when he said "if you pay people 90% sickness for the first two days then you can't be surprised when only 10% turn up on Monday"
"Yes..economically it is not good..But we are liberals..So...it must be." ND The Eastenders episode has already happened! It was on Tues I think when Carol and Denise had a conversation about it. 1) How can we now cope without Mandiba - will anything ever be the same again? 2) How can we, as mere humans, hope to live up to his parousiac munificence? 3) How long should we mourn? 4) Why Lord, why did they take him and not me? 5) Pirelli or Michelin gives the best necklace performance? Off on yet another Chrimbo do so probably duck out of this one - but chuck in a few legacies, inspirationals, unifieds and couragouses and I reckon i'm good to go. The BBC Director of News said 'he was probably the greatest statesman in the last 100 years!' Sometimes, sometimes it's really just not worth the effort to even laugh. of course, what he did once he had won marked him out as an example no other leader has lived up to since then, all this openness and forgiveness and not clinging on to power till the very last moment thing never caught on. The only relief afforded by the expected BBC Mandelafest was that it brought to an end the week long coverage of the nuclear bomb explosion in Glasgow. Very sad event, for sure, but did we need constant updates, interviews with whomsoever regarding what will happen to the site, repeated emphasis on how wonderful Glaswegians are (of course, denizens of any other city would have just stood around and done nothing). The BBC seem never to learn. The bbc learn a lot EK. Just the wrong stuff. @andrew as has been said before: "the winners get to write the history books"
@Timbo, well in the case of Mandela it seems the historians are more than happy to refer to his terrorist past. Only the news media seems to want to ignore it. I'm guessing the historians have seen enough of Africa to know that SA is on the same path as Zim and Mandela's "legacy" will be washed away by brutal tribalism. Historians will, in the fullness of time, create a narrative which will put the blame for any future violence at the feet of Mandela's willingness to engage in violence for political ends. The left, and its cheerleaders in the BBC, will once again find themselves on the wrong side of the argument.